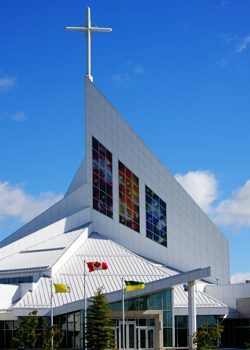 Established in 2011, the 28.5 million dollar project of the Cathedral of the Holy Family is unique for being both the first Roman Catholic cathedral to be built in Canada in over 50 years, while it is also the first cathedral in North America to integrate solar cells into its windows. High on the South side of the cathedral the installation “Lux Gloria” (Light of Glory) by the Canadian artist Sarah Hall consists of three windows, 54 panels, and 1113 hand soldered silver solar cells. Saskatoon, as the sunniest city in Canada, has almost 2,400 sun hours a year, making it an ideal place to foster this technology. The solar cells in this installation, using photovoltaic technology, are able to generate 2500kw of electricity annually, or enough to power about five homes. The 65,000 sq. 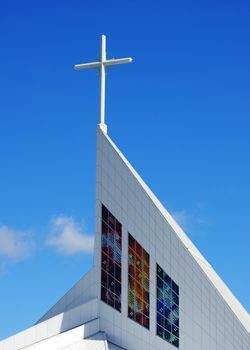 foot cathedral is a site of sustainability and scientific innovation. Hall’s work can also be viewed in the interior of the cathedral in the main sanctuary and the spire of the cathedral. Sarah Hall’s artistic design for this project was fabricated at the internationally renowned “Glasmalerei Peters Studios” in the Northwest town of Paderborn, Germany. “Glasmalerei Studios” were founded more than one hundred years ago by Otto Peters. Otto Peters was born in 1875 in the Lower Rhine, which at this time was the centre of stained glass techniques and craft in Germany. Peters trained as a glass painter and in 1912 founded his workshop in Paderborn. Despite the strife of two major world wars, Peters was able to keep his studio alive and today it is a third and fourth generation family business. Sarah Hall fabricates her art glass projects exclusively in Germany, and has worked with solar art windows in Germany for many years. Wilhelm Peters and two artisans from the “Glasmalerei Studios” were present in Saskatoon, helping with the wiring, connections, and installation of “Lux Gloria”. Considered a culturally and architecturally significant piece, the American Institute of Architects awarded Hall recognition in 2014 for ”Lux Gloria” as a landmark design through its use of photovoltaic cells as part of its artistic expression. “Lux Gloria” pays tribute to prairie skies through its use of red, orange, blues, and white, while the fabrication and technique of the piece allude to the history of glass painting and the German studio`s technical, scientific, and artistic merit.